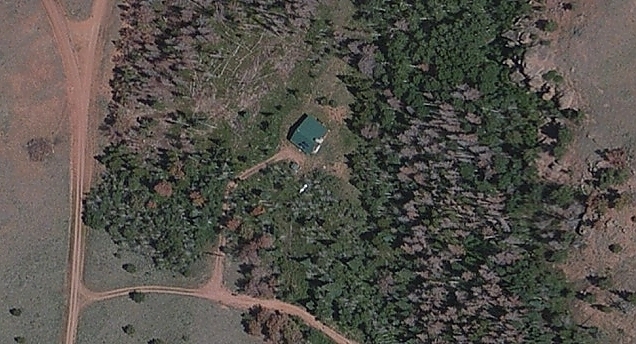 Here is an aerial view of the cabin site, taken from Apple Maps. Google Maps and Google Earth have similar views. You can see several features of the cabin and surrounding land. There is a small shed, about 8' x 8' just "below" the cabin. That is where we store the backup generator, tools and various supplies. We will likely build a larger storage shed to the left of it. You can also see the white 1000 gallon propane tank in the same area. The solar panels on the roof are just visible. When the wind turbine is recommissioned, it will be between the propane tank and the entry road below the cabin. You can also see many downed trees to the left. That is west of the cabin--the direction that fire is likely to come from. The trees were all killed by pine beetles, and thus were a fire threat. They were cut down many years ago and most were hauled away. Those you can see here are subsequent blow-down. They are now cleaned up and stacked ready to turn into firewood. I'm guessing this photo is 2 to 3 years old. All the gray/brown trees are beetle kill, so you can see there is plenty of additional firewood coming!